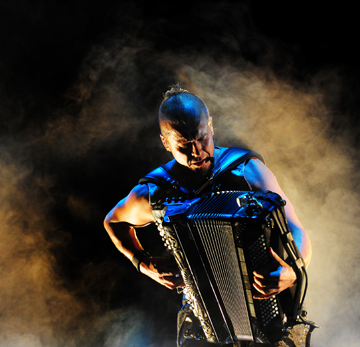 Finnish accordion adventurist Kimmo Pohjonen is internationally known for revolutionizing accordion music, sound and performance. A visionary of boundless energy and creativity, Pohjonen's roots include folk, dance, classical, rock, experimental, theatre music and more. In 2014, Pohjonen celebrated his fiftieth anniversary in concert with Kronos Quartet at Helsinki Festival. A second celebration concert was held at Tamperetalo, an extravaganza showcasing projects from Pohjonen's entire career, including Uniko with Proton String Quartet, Bright Shadow with Finland's top ballerina Minna Tervamäki, Accordion Wrestling featuring Finnish wrestlers, Earth Machine Music with farmers and their machines. Pohjonen also works with King Crimson's Pat Mastelotto and Trey Gunn in the power trio KTU. Kimmo also works with French drummer Eric Echampard as an improvisational duo. The documentary film about Pohjonen, Soundbreaker, premiered in 2012, won the "Prix de la Création /Award for Creativity" at FIFA Montreal and has been shown in over thirty countries and in over fifty German cities cinemas. Soundbreaker is released on DVD and available as iTunes app. Pohjonen has composed several film scores including Chinese / Finnish feature film Jade Warrior for which he and colleague Samuli Kosminen won the Finnish Jussi Award for Best Film Score of 2005. Pohjonen has performed over one thousand concerts at some of the world's most prestigious concert halls and festivals including The Proms at Royal Albert Hall and The Barbican in London and Lincoln Centre, Köln Philharmonie and Carnegie Hall in New York.